Mormon Wookiee: #68: Gratitude for a great hometeacher. #68: Gratitude for a great hometeacher. Our garbage disposal has been broken for a couple of weeks, and whatever was in there really reeks (Ha, Dr. Seuss Jr.). I kept hoping that it would magically fix itself, but as we all know, magic is only real in Great Britain and on the planet Dathomir. At first I figured something was simply blocking the blades (because, duh, garbage disposals have blades). But even after we reached around inside to dislodge any gunk (gross), it still wouldn't work. 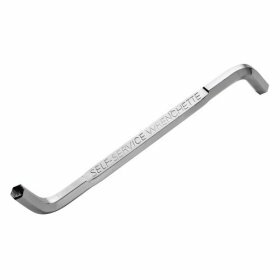 Previously, when our disposal stopped working a couple of years ago, I bought a "self-service wrenchette", which you are supposed to stick into the hole in the bottom of the disposal and twist around a couple thousand times. I was pretty confident this would do the trick. But, guess what? It didn't. Thanks for nothing, wrenchette. Finally, I repeatedly pressed the red reset button on the bottom of the disposal in the hope that it would reset the circuit. But when it didn't work, I became so frustrated that my face turned just as red as the button. I was stuck. And the disposal stunk. And I didn't know how to fix it. And I felt very unmanly (and not just because I love Taylor Swift music). Then....Diane had a great idea: buy a new disposal and call our home teacher for help installing it! Because I don't want to embarrass him, I won't mention my home teacher by name, but he is one of my heroes. He is a convert to the Church, a great father and husband, a doggone funny guy, and he also happens to be a genius at fixing things like garbage disposals. Yesterday afternoon, after going on a 55-mile bike ride in the morning, and working a full day, he came over and installed our new disposal (without swearing even once!) in under an hour. And he even let me hand him tools so that I would feel manly. It was incredibly awesome. At the end, we offered to make him some cookies, but he said he was just glad for the chance to serve (although he did joke that he would love it if I made him some Brazilian cheese balls). Thanks again, home teacher. You make me want to be a better one myself. What not even one Star Wars reference? :) Sounds like a pretty awesome home teacher. I have no idea who our home teachers even are! But my husband could easily have been your home teacher, because he goes on ridiculously long bike rides, fixes things without swearing and loves cheese bread...He also just installed our first ever garbage disposal earlier this spring. Haha! Your Steve does seem just like my home teacher! When my home teacher was here, he was even patient enough to teach me how to do it next time. I'm really grateful he came over (plus, later that night he took his wife out for their anniversary dinner and prepared his lesson for Sunday School). He's a great guy. #70: A simple testimony of two things. #69: 1 fuse. $700 of fireworks.